Cross and Cutlass: You are already in heaven! You are already in heaven! How many times have we heard this verse in church or read it in the Bible and just sort of moved on past it without really considering the absolute shocking incredibly wonderful statement saying that WE (that means You, if you belong to God) are SEATED (past tense, which means NOW) in the heavenly places with Jesus.?? Have you ever stopped to ponder what that means? Well, you say, how can that be true? I'm still right here on earth, stuck in all the muck and mire of this world. Why yes, that's true for your Body and your Soul. You see, we are triune beings just like God. We are a spirit living within a body that has a soul. (The soul is your mind, will, and emotions) . The most important part of us and the Eternal part is our Spirit. We are made in God's image, and the Scripture tells us that God is Spirit. Hence, we are spirit as well. It is your spirit that is really you. Your spirit directs your mind and emotions and your mind directs your body. But the source of power is your spirit. Unfortunately many believers today and all non-believers allow their soul and/or body to be the boss, and because our soul and bodies are tainted with the curse of sin and are unregenerate, they will only lead us into darkness and death. Before you met Jesus, your spirit was essentially dead. It was born with a sense of right and wrong called our conscience, but over the years, without the life-giving infusion of God's spirit, it slowly began to die. If you ignored your conscience and kept sinning and sinning, then your spirit died even more. When you gave your entire life to Jesus, your spirit came alive! (1 Peter 3:18) Now, your spirit is infused with the Holy Spirit and is completely regenerated. You are a new man or a new woman! Old things have passed away. But your soul and body are still in sin here on earth. It's like you are wearing some old, ragged clothing that you can't take off. That clothing is keeping you in a certain place for now that you can't leave. But when that clothing grows too old and worn and torn and it falls off you, then your spirit is free! 3. God's heaven where the spirits of dead saints are and where God's throne is. Notice God's heaven is above the other heavens, both in physical location and in power. God's throne is the seat of all power and dominion! It is where He rules all of His creation. It is where He monitors Satan's activities, examines every thought of man, and orders His armies of angels on their duties. It is also where every spiritual blessing is bestowed. It is where Jesus now sits beside the Father! He worked in Christ when He raised Him from the dead and seated Him at His right hand in the heavenly places, far above all principality and power and might and dominion, and every name that is named, not only in this age but also in that which is to come. Okay, you say. I know all that. But do you know that YOU are THERE NOW! 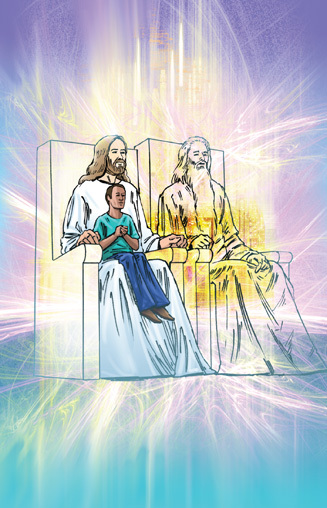 Scripture says clearly that we are seated with Christ. Not your body, not your soul, so you can't see where you are with your physical senses. Your physical senses are telling you that you are still on earth. And yes, your body is. But in reality, your spirit is in heaven. It is there that you commune with the Lord, it is there that you present your requests, your concerns, your fears. It is there that you worship! And on occasion, when you are deep in that prayer and worship, the glory and presence of God can be felt in your soul and body. I know I've experienced that! So why am I telling you this? What difference does it make if your body is still here on earth? Well, your mindset, what you think about where you really are makes ALL THE DIFFERENCE! Because seated in the heavenlies with Christ puts you in a great position of power, love, and blessing! I see so many Christians living defeated lives. Yes, we will have trouble in this world, but we should also be victorious! If we are truly seated with Jesus in heaven, then we need to start acting like it! We need to start believing it! We need to appropriate the power of that throne room and the name of Jesus to win the victory here on earth, over Satan, over sickness, poverty, despair, etc. Why are we living "under the circumstances." when we are seated far above them? Below, I've listed a few Scriptures that tell us what power a true believer has been given in Jesus! Please read them over, meditate on them, pray over them, memorize them. They will increase your faith. Stop thinking of yourself as being stuck here on this sinful world. Take some time this week, get alone and meditate on the fact that your spirit is seated in heaven with Jesus! Think about this as often as you can until it gets deep within you and becomes your reality. I guarantee it will change your life! I love this post! Never have I even thought such an idea and it really just changed my world in an instant. Thank you for sharing so many incredible things every week! My brother has theorized about this in the past. I'll have to show him this post :). He will enjoy it.